Networked multimedia is catching on, but a traditional downside is having to leave all of your PCs on. This isn't very efficient in energy terms, so wouldn't it be great if you could shove just the hard drive onto your network, and use that to store your multimedia files instead? Of course, you can, thanks to a proven technology known as Network-Attached Storage (NAS). 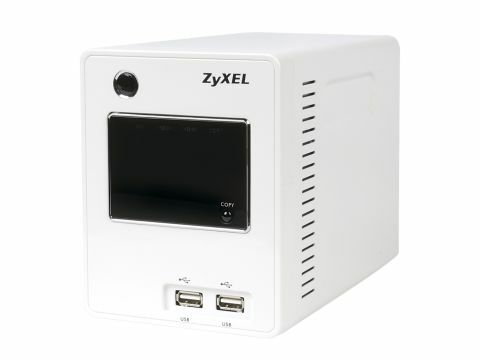 Zyxel's neat and well-built NSA-220 is one such device. The downside is that you have to buy and fit your own hard drives (typically £50 for 250GB). Any type of media (including hi-def video) can be stored by the NSA-220 - the limit is what's supported by your client. Indeed, the NSA-220 makes for excellent networked backup (it's supplied with an autobackup utility). * Any DLNA-compliant uPnP networked media client (most of 'em!) can stream audio, video and photos from the NSA-220. We experienced no glitches. * No longer will you have an excuse for not backing up important files from your computers. * No drives - you must supply your own SATA I/II types. Installation is, however, remarkably simple - the drives are screwed into a bay, which slides into an internal 'cage' accessible from the rear of the machine.